We all know WordPress first started as a blogging platform and later on, thanks to ongoing development, it became one of the most popular CMS in the world. It means that not only a blog but also any website can be created using WordPress. However, today, I will focus on the hotel website with a room booking service to show you how to build a hotel website using WordPress. But firstly, before we talk about the opportunities WordPress offers hoteliers and hotel website developers, you might be interested whether WordPress is an excellent choice for this sort of a site or not? A hotel booking system is quite a complex one, so lots of cloud hotel software providers love to spread the myth that WordPress cannot be the option backing their claim with something as ridiculous as calling WordPress non-scalable. A hotel booking system is quite a complex one, so lots of cloud hotel software providers love to spread the myth that WordPress cannot be the option backing their claim with something as ridiculous as calling WordPress non-scalable. Would you mind if we start with the reasons why building a hotel site using WordPress is a brilliant decision? Hotel business owners dread building the sites themselves, and we are going to show that there is nothing to be afraid of. Put another way, WordPress powers tons of different huge and small websites all over the net (28% of all websites, to be more precise), serving a diverse area of businesses. WordPress plugin and theme providers offer a lot of beautiful hotel designs and fully functional plugins to handle the instant hotel bookings. The New York Times and TechCrunch are also powered by WordPress, by the way. A WordPress theme + hosting and domain is approx $350 per year; the room booking plugin is around $30 – $90 per year (if the reservation plugin is already included in the theme, you save even more money). But what about the proprietary software? The average cost may vary from $500 to $1000 yearly, which is a cost not counting the expenses on the website itself (design, hosting, domain). Furthermore, this cost may increase depending on the number of rooms, etc. 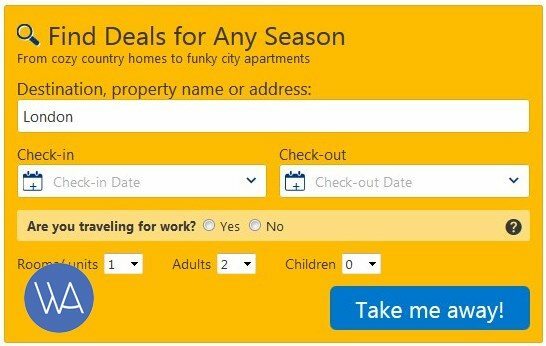 Yes, you can set the WordPress website following easy instructions and enable online bookings with the hotel room booking plugin with no or little tech help! If you are a developer, it will be simply a breeze to create the WordPress hotel site and explain to the client how the system works. Plus, training the hotel staff to manage all bookings won’t take too much time or lessons – just show which buttons to click! Lost of WordPress plugins come with built-in payment gateways, which are safe to pay with. It means that your brand website can serve the needs of travelers similarly to OTAs (online travel agency) regarding making a reservation: travelers choose a room and reserve it with or without payment. WordPress hotel booking plugins come with different payment gateways included (or you need to buy the add-ons for additional gateways). WordPress comes with great professional free SEO plugins to help you rank high and optimize your website for the search engines. WordPress is an open-source software with many volunteers behind it. WordPress plays nicely with different third-party integrations, plugins, custom code tweaks, etc. Customization options are close to unlimited, that is. A user-friendly dashboard is at your hand; no coding skills are needed (of course, if you don’t need anything super fancy). Sounds good? As a particular type of a website, a hotel booking site has its own requirements such as Search Availability form, Rooms Listing (with features of each type), Room Management, Booking Management, etc. 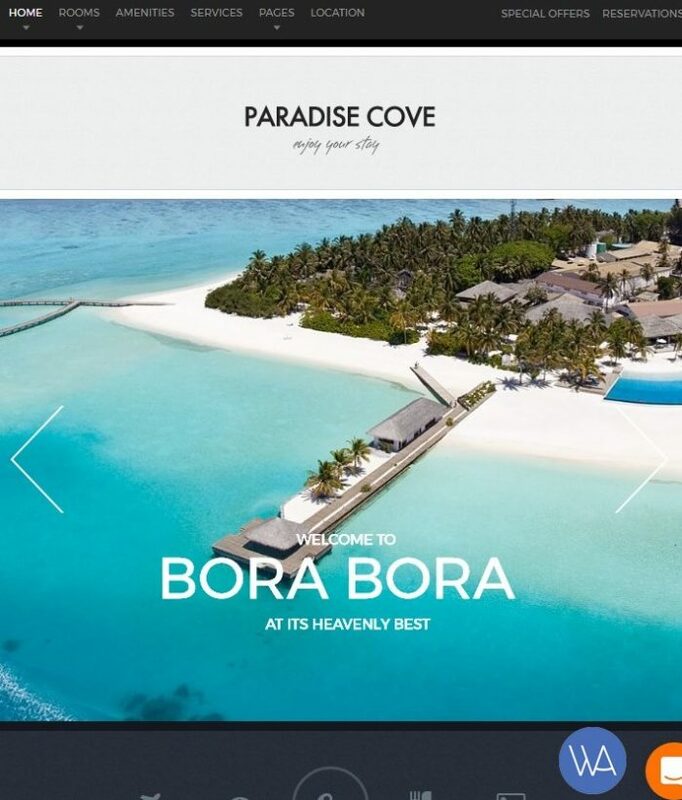 In this article, necessary elements and features for a hotel website will be analyzed. 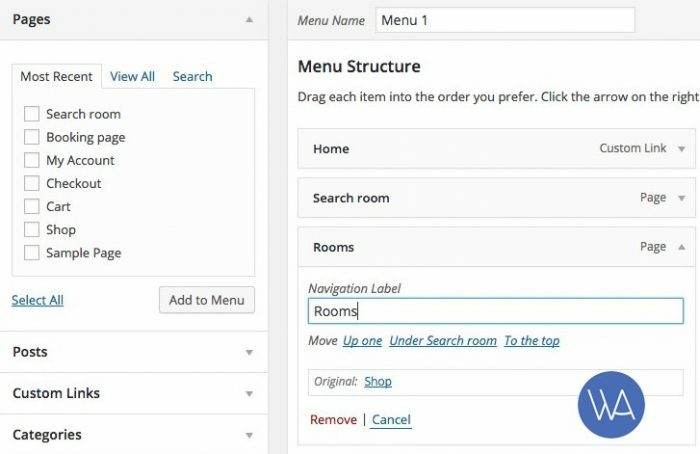 Using the room reservation plugin + any WordPress theme (including hotel theme). 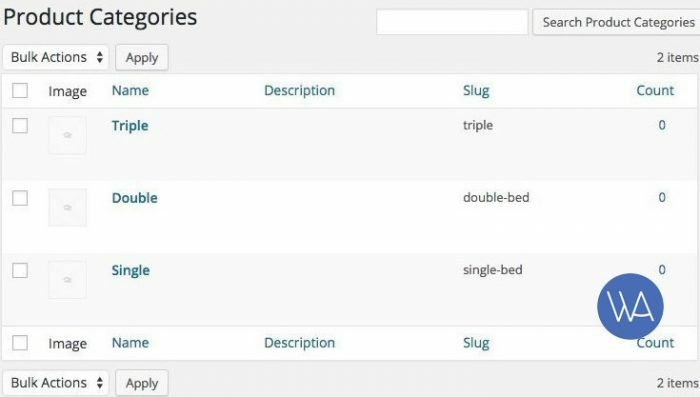 Using WooCommerce plugin (to manage the rooms as products). To some extent, this is the easiest way to build a WordPress hotel site. There are lots of great responsive hotel WordPress themes that come with all necessary content elements, and sometimes even with a built-in property reservation plugin, making it really affordable and hassle-free solution for many hotel businesses. If you want to cut down expenses and speed up the process of building a site, consider checking our article with 15+ Best WordPress Hotel Themes. Quick tip: read the description of each theme in details to find out whether the theme provides a fully functional plugin to handle live bookings. Or, probably, you are okay with the contact form only, when each booking should be confirmed manually? Just one thing to remember – modern travelers would not be that happy with just a contact form, that’s why they love booking via OTAs like Expedia. So, probably your hotel site should accept live bookings on the same level of security and user-friendliness as those OTAs? To be competitive, your brand website should be maximum guest-friendly, with the quick and safe booking process, guaranteeing that they will have a place to sleep. But if you don’t want all those bookings to be fully processed through the site and just need a good design to tell people more about your hotel, a WordPress Hotel theme will be fine. This is also a great approach to proceed with if you already have a theme and just need to implement a reservation engine into it. 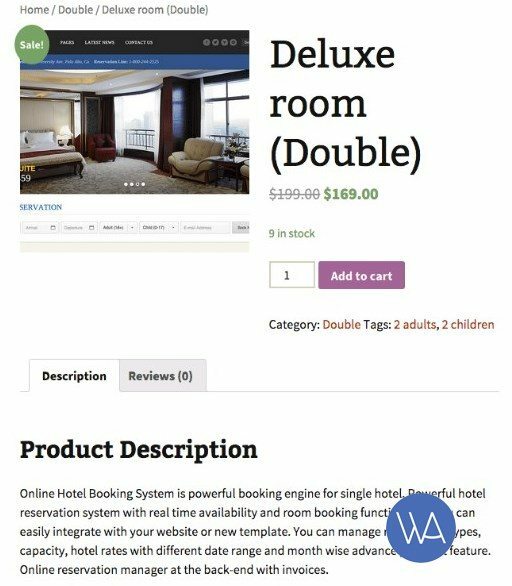 This is a great hotel business dedicated WordPress room reservation plugin which can be used for hotels, renting out multiple apartments, guest houses, etc. The plugin allows to add unlimited number of accommodations, list their photos, descriptions, amenities, capacity, bed types, packages, and all other important info, enabling live bookings. The guests can search the room via a Search availability form. The seasonal pricing and rates are supported. There are also frontend and backend demo you may check out. As a website administrator, you’ll need to set up the system to accept online bookings via PayPal, Stripe, 2Checkout, Braintree, etc (full or deposit price), or charge guests after arrival. You may also confirm the bookings manually or automatically upon payment. The plugin supports all email notifications, discount coupons system, multiple rooms bookings at a time, and much more. There are Oceanica and Villagio WordPress hotel themes already integrated with the plugin. Booki is a popular booking plugin, which is not hotel dedicated but can be used for implementing a booking system. It comes with different booking calendars that you’ll need to add to each accommodation. You may feature all your accommodations, set seasonal pricing and rates, sell services, etc. the plugin is pretty advanced and multipurpose so you may use it for any other booking services as well. However, it doesn’t come with the search availability form, so you’ll need to work with each room to rent it out properly. It supports PayPal Express with guest checkout, CC payments via Authorize.net or Stripe. HBook is a great hotel business dedicated plugin with a lot of options. It comes with all necessary settings like seasons, rates, support for different payment gateways, etc. it also allows to edit the frontend labels to customize it to the needs of your particular hotel establishment. The plugin is a pretty all-around solution with all necessary features create a rooms listing and let people book rooms online. If you sell packages or extra services, you may also add them as options to the reservation. 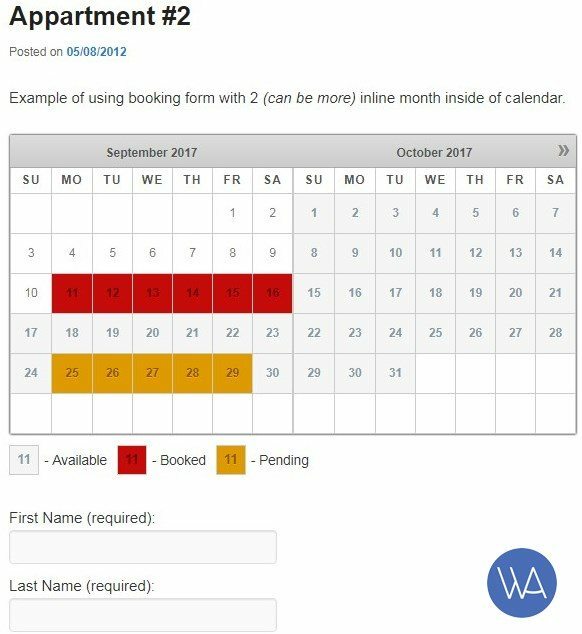 Booking Calendar is a popular WordPress Booking plugin, which is not hotel business dedicated but works pretty well as a workaround. It lets you create an availability calendar with existing hotel rooms so that your guests can choose the needed room and submit a booking request. The plugin supports different ways of email notifications, customizable calendars, etc. Basically, for the system to work, you’ll need to add booking calendars under each accommodation. The plugin comes with a bit simplified design and limited features (as it’s multipurpose), but it’s pretty affordable, so if you are on the modest budget (or your client), this can be a good way to go. Opal Hotel Booking plugin is a free plugin for building a booking system for your site on WordPress. It comes with a great modern design and lots of useful options – creating different types of rooms with descriptions, amenities, rates, etc. PayPal Standard and Stripe payments for online bookings are supported. As you see, this is another free solution for building a WordPress hotel site (in addition to Booking Calendar), but it’s a bit more suitable, because it was designed specifically for hospitality business websites (hotels, guest houses, apartments, etc.). The plugin is regularly updated, so you can rely on it with building a site. Of course, the plugin is limited in features, because it’s free, but it will provide you with the needed basics (it may be a good suite for a single B&B website). There are several demos where the plugin is featured in premium themes; however, it’s not clear how the free version will work in some standard WordPress themes. You may give it a try, however. To sum up, many WordPress room reservation plugins do the job great, the only limitation you may face is not advanced automatic synchronization with OTAs (of course, in case you need it). This synchronization is generally served by iCal, and you’ll need to specify it with the plugin provider in advance. WooCommerce is a good solution to build a hotel site primarily because it’s reputable and offers a bunch of options, payment gateways, etc. 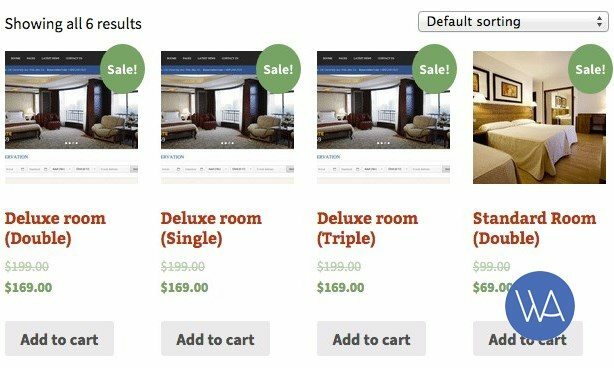 Using this plugin for your hotel, you can define a room or room type as a product, set price and feature it. Since WooCommerce is a complete service for online business, the above features seem to be covered. However, the room is occupied in a certain time; as a result, a product (room/ room type) would be automatically increased after checking out, and normally you have to update it manually. Let’s try to see if we can use WooCommerce like a hotel booking tool. There are different room types: standard, deluxe, suite…and their capacity (single bed, double, number of adults, children…) in the hotel. Now I will define a hotel Room as a product, type as product category and the capacity as a product tag. Therefore we can use product management flow in WooCommerce as room management in a hotel site service. As you can see, the product category is used to define the room capacity with three types: Single, Double and Triple. Therefore we have now a taxonomy to classify our hotel rooms. Next, I use product tags to define the room capacity of each type: 1 adult, two adults, one child, two children, etc. This step provides more details in each room capacity and also will fit into each room type below. When all room types are added, let’s show our rooms. Here we have two kinds: Standard and Deluxe rooms. You can classify them by services (include or exclude morning buffet, bathtub, etc.) and the hotel rooms are fully described as a list of products. You can set the property (number of available rooms), set price, payment gateway for reservation, etc. Now, take it to front-end and place the shop page into the navigation menu and rename it to “Rooms” as the room list. There are some more labels you need to change to get completely fit with the hotel site, but I will leave this job to you guys. Alternatively, you can use it’s the best way to go with dedicated WooCommerce Bookings plugin. Finally, we have to provide a search form for the customer to find out the best room for their needs (it’s especially useful if you provide rooms for multiple hotels). If you take a look around, you will see the search widget is a must-have element of a hotel booking website. Customers will not waste their time manually searching through your site to find available rooms and room types. Those search widgets on popular OTAs are pretty advanced and handy. To add this feature to your site, you may go with WooCommerce Bookings Availability Search Widget plugin. Overall, WooCommerce is a good approach. However, using WooCommerce for building a hotel site can be considered as a kind of workaround, a bit more expensive than other solutions. WordPress is a compelling platform to build a website for a hotel, B&B, apartment, vacation rental, etc. It plays nicely with different SEO plugins, it’s cost-effective, advanced concerning online room bookings, hosting and design, to name just a few benefits. And your choice is huge – from a WordPress hotel theme to a dedicated hotel room reservation plugin and even WooCommerce. Check what’s the smartest price and features bundle for your needs and be sure – you can build the website with the whole booking system yourself! Because this is what WordPress was created for. Got a question or want to add a suggestion? Welcome! Next Post Why Should your WordPress Business have an Affiliate Disclosure page? Online Hotel booking system pro is a bit outdated, it has not been updated since 2015. And the fronted design needs some polishing as well 🙂 Can we recommend our custom solution – a fully automated hotel booking engine for WordPress that we constantly work on https://wparena.com/go/motopress-hotel-booking-plugin/ This is a standalone plugin for any theme. Would be happy to hear your feedback! Sure Emily, email me using the contact form and we can discuss it further. Hi, This is very good article who want to build hotel website. You explained very well.